Kentucky Rural Housing 2015 Maps for Rural Development Housing Loans Eligibility Website. In order to be subject to current eligibility maps, a “complete” loan guarantee request (application) must be received by the RHS, prior to February 2, 2015. A “complete” loan guarantee request received by the RHS on or after February 2, 2015 will be subject to the new rural area designations/maps. Very low monthly PMI According to a recent Administrative Notice (AN4557) sent out by USDA, starting October 1, 2011 the upfront guarantee fee will be reduced from 3.5% of the loan amount to 2% with the addition of minimal monthly mortgage insuranceon all purchase transactions with the USDA No Money Down Mortgage.On a refinance transactions involving USDA Mortgages, the upfront guarantee fee will remain at 1% of the loan amount but will include the monthly mortgage insurance. Education/training substitute for job tenure Income history for ratios is waived. Have an adjusted annual household income that does not exceed the moderate income limit established for the area. A family’s income includes the total gross income of the applicant, co-applicant and any other adults in the household. Applicants may be eligible to make certain adjustments to gross income – such as annual child care expenses and $480 for each minor child – in order to qualify.USDA Rural Development field offices can provide information on the moderate income limits for the areas that fall within their jurisdiction, and can provide further guidance on calculating household income. Have repayment ability based on the following ratios: Principle, Interest, Taxes, and Insurance (PITI) divided by gross monthly income must be equal to or less than 29 percent. Total debt divided by gross monthly income must be equal to, or less than, 41 percent. A Kentucky USDA Guaranteed Loan is a Government Insured 100% Purchase Loan. These loans are only offered in rural areas. Why choose a Kentucky USDA Mortgage? 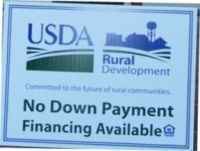 USDA Loans require no down payment. There are no prepayment penalties for USDA Rural Home Loans. A USDA Rural Development Loan has low monthly mortgage insurance. A USDA Rural Development Mortgage is available all rural areas of the country, provided a market exists for the property and the home meets HUD’s minimum property standards. A USDA Rural Housing Loan can be used to purchase a new or existing one family home in rural areas. USDA RD Loans are offered at terms of 30 years with a fixed interest rate. What is Considered a Kentucky Rural Area by the USDA? Rural areas include open country and places with population of 10,000 or less and—under certain conditions—towns and cities. There is an automated rural area eligibility calculator for USDA home loans at: http://eligibility.sc.egov.usda.gov. What is the Maximum Loan Amount for a Kentucky USDA Loan? There is no maximum loan amount for a USDA rural mortgage. However, it is limited by the appraised value and repayment ability (determined by your household income). What is the Maximum LTV for a Kentucky USDA Loan? The maximum USDA rural loan LTV can be up to 100% LTV plus the Agency guarantee fee. Can Closing Costs be Financed into the Loan? Yes, any difference between the contract price and the appraisal value can be used to finance normal closing costs for a Kentucky USDA mortgage. What is a Kentucky USDA Loan Guarantee? USDA Rural Development Single Family Housing Program serves as a safety net for mortgage lenders. The USDA provides the full faith and assurance of the U.S. government that any financial loss resulting from servicing the loan will be reimbursed in full up to an amount not exceeding 90% of the original loan amount. All loss up to an amount not exceeding 35% of the original loan is fully reimbursed. Any loss amount exceeding the 35% is 85% reimbursed. This leaves the lender only 15% exposed on the loss amount above the 35% of original loan. In the majority of cases, the total loss does not exceed 35% of the original loan and the lenders are fully reimbursed. This guarantee provides lenders an expanded level of protection against losses. The quality of this guarantee allows lenders to easily sell the loans on the secondary market. 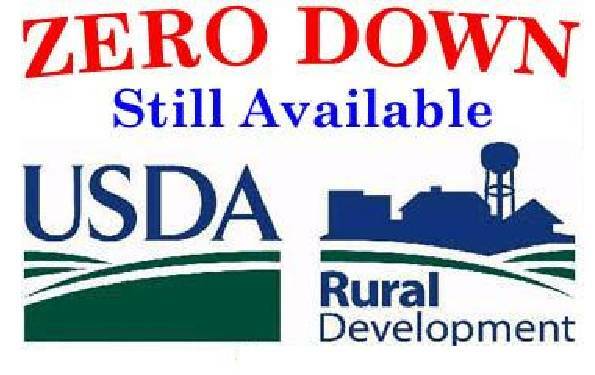 Beginning March 27, 2013, RHS will begin using the 2010 Decennial Census data to determine property and income eligibility for Kentucky properties for USDA and Rural Housing Loans in Kentucky . This means that a borrower in any area which has experienced a significant change in population and/or median income between 2000 and 2010 may lose eligibility for the Kentucky Rural Housing or USDA RHS Loan Program. Loans on hand will be allowed to continue using the 2000 Census data eligibility requirements only if there is a completed loan application (and all the documentation that entails) dated on or before March 26, 2013. Any loan using the 2000 Census data eligibility requirements must close and fund by September 30, 2013. RHS or Rural Housing / USDA has not yet released a list of the county specific changes that will occur for Kentucky Properties. . We encourage everyone to make their borrowers aware that changes will occur and to try and get applications completed for a Kentucky USDA Property by March 26th for any cases where continued eligibility may be in jeopardy. Seller concessions cannot be used to pay down buyer’s debt. deferment period. If the credit report does not indicate a monthly repayment amount, Lender may use the monthly payment amount provided by the loan servicer, or 1% of the loan balance reflected on the RMCR. Refers to the existence of multiple levels of risk in an application such as marginal credit, high repayment ratios, extensive use of other credit, payment shock, etc. Lenders should be very cautious when evaluating applications with multiple risk levels. Measured by dividing the new PITI by previous housing expenses minus 1. In cases where payment shock is 100% or higher, no additional risk layering should be allowed unless strong compensating factors are present. The payment shock in this example is above 100% and therefore is a risk factor. The lender approves a credit waiver and supplies all back up documentation used in the decision making process. Lender must document that the instances of unacceptable credit must have been temporary in nature and beyond the applicant’s control or the result of a justifiable dispute relative to defective goods or services. A lender need not require collection accounts to be paid in full if there are mitigating circumstances as described in RD Instruction 1980.345 (d)(3). Credit scores of 640 and above may eliminate the need for lender documentation of credit waivers.  The mortgage loan must be underwritten at the note rate.  Buydown funds may come from the seller, lender, or third party.  Buydown funds may not come from the borrower. and increased by no more than 1% annually for no more than 2 years.